It was only a few years back that I stumbled upon the beauty of Pondy. I had been dying to visit the French city since. So when I was asked to choose a weekend getaway destination, I was quick to decide, and I am glad I chose Pondy. So far, Pondicherry tops my list of cities in India because it's got everything, it literally has everything. It's got churches, temples, museums, it's got beaches, beautiful streets, and colorful cafes; it's got the hustle bustle of a city but it also has the peace and quiet; AND it has the friendliest people that I have ever come across. Pondicherry, if you ask me is a perfect dish, with all the ingredients in just the right amount. What more could you ask? Well, I couldn't. It being a chilled-out weekend trip for us, we chose not to keep hopping from one place to the other. However, even 3 days was an ample time to explore quite a few places in the city. Tired from all the traveling from the previous night, we headed straight to the Promenade late in the morning. Thankfully, our host's lovely home was only a 2-minutes drive to the place. The Promenade is to Pondicherry what Marine Drive is to Mumbai, except that with no vehicles, the former takes the cake. As sunny as it was, it did not do the slightest harm to the windy walking plaza. It was just as pleasant to take a stroll here. Luckily for my growling tummy, we came across Le Cafe. Hurriedly, I grabbed a table facing the sea. Sipping my watermelon juice and watching the sea stretching endlessly was just what I had needed to begin the trip. Next we headed to Auroville, which was a 15 minute ride from the Promenade. A short movie gave us a brief idea about the principles of Auroville, and why it was founded. To sum up, Auroville is a planned township which was founded by the Mother in 1968. It has residents from all over the world who live together above caste and creed. In the center of the town is the Matrimandir, a place for silent concentration. Note: To visit the Matrimandir, you need to book at least 2 days in advance. Also interesting is the fact that the urn in the Auroville amphitheatre contains soil from all the 124 countries which participated in its inauguration, along with 23 Indian states. The walk towards Matrimandir (about 2 kms from the entrance) is a peaceful one, with interesting quotes to keep you company all along. One may also choose to rent a bicycle to go around. The place as a whole, feels like a big beautiful garden, with tall trees, lots of flowers and a variety of birds. Luckily, we spotted a beautiful Indian Paradise Flycatcher on one of the trees. 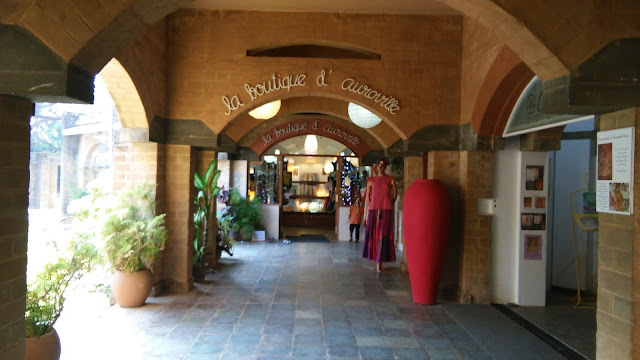 After spending some time eyeing the beauty of the beautiful Matrimandir, we decided to go back and explore the cafes and boutique shops in the vicinity. 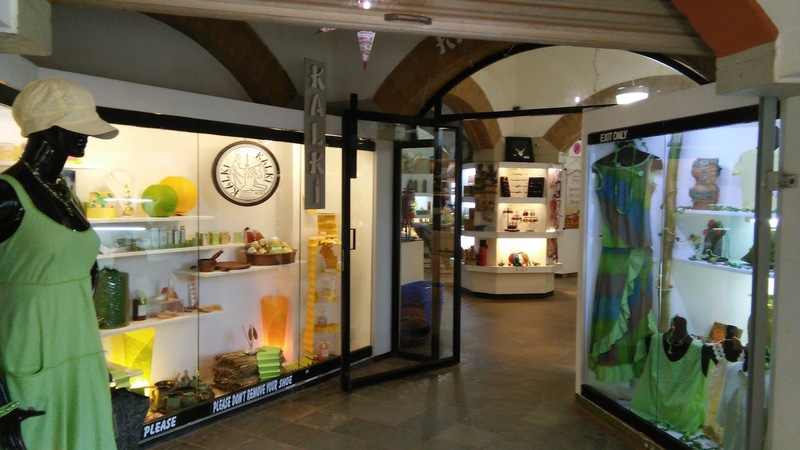 The cafes offered a mix of both, Indian and French food; while the boutiques showcased a variety of items including clothing, jewelry, handmade paper items, and souvenirs. We decided to spend our evening at the Promenade, and what a pleasure it is to be here for a sunset. The cooling of the breeze, the changing colors of the skies, accompanied with the music of waves - a treat to all the senses. Once the sun had set, and the day came to an end, people from every part of the city started to come in to wind down for the day: gajra-clad women indulging in the daily gossip, new moms chasing after their toddlers, the toddlers chasing the soapy bubbles, a group of young thalaiva fans, tourists from all over the world, and fellow visitors like us - everyone comes here to wind up their day. This is one place I got to experience the culture of the city, which instantly made it my favorite. For dinner, we decided to head to the Bay of Buddha. The lovely sea-facing terrace restaurant was decorated very well with dim lighting, and a specialty of Pondy - the paper balloons. It was just the place to give a fancy end to our evening. We started the next morning with an early sunrise. I am not much of an early riser, but give me a sunrise on a beach, I'll be the first one to wake. It's not called awakening for nothing. We went back home to have breakfast with our lovely host Mr. Prithvijit, and got introduced to their very adorable dogs Zorro and Pupatti. After a long discussion of places to visit, we quickly left for the day, our first stop being the Arulmigu Manakula Vinayagar Temple. This Ganesha temple is adorned with huge canvases which depict events from Lord Ganesha's life. Like all the temples in South, this one too is colorful, grand, and beautiful. Next on the list was the Pondicherry Museum. The museum is divided into various sections, namely, Bronze gallery, French gallery, and the Geology section. While the Bronze gallery has bronze sculptures of gods and goddesses from the Pallava and Chola dynasties, the French gallery displays a collection of fine French furniture. The museum also has a wide collection of arms, ammunition, and coins. 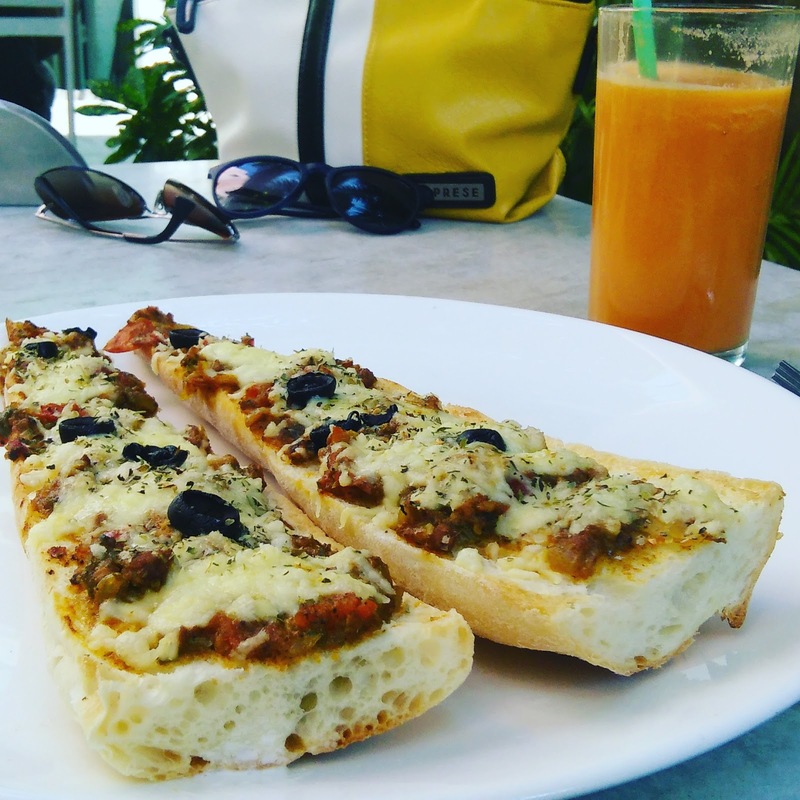 For lunch, we decided to stop by the very popular Cafe Des Arts. A casual eatery with simple snacks on the menu, the place failed to impress as far as the food was concerned. The setting of the place was however, quite nice. This is where we realized we still hadn't seen any of the beautiful churches in Pondy yet. Since we had too many places to explore, we decided to visit the one that was nearest - the Eglise de Notre Dame des Anges. 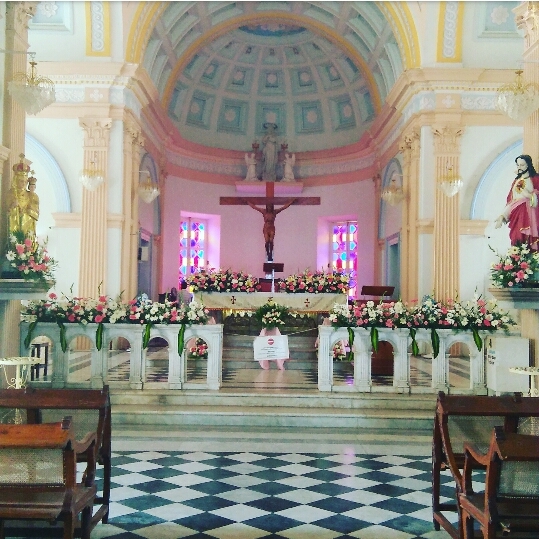 The church, also known as Our Lady of Angels Church is the fourth-oldest church in Pondicherry. Peaceful and beautiful, it is located right on the Promenade. The colorful glass ceilings along with the lovely flower decorations make it a must-go. We are so happy we stumbled on this one. And then it was time for us to GPS the lighthouse. Going to the top of the lighthouse needed us to climb a never-ending stairwell. But it was every bit worth it. 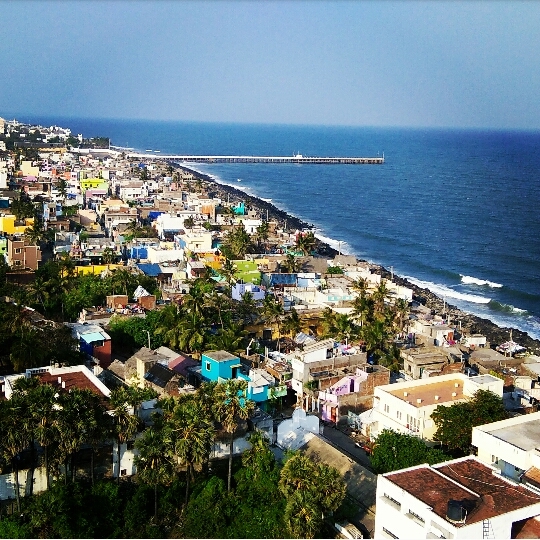 The view of the clear blue waves from the top, the small huts on the beaches, the lovely green of the coconut trees and the various colors of Pondicherry were all worth the pain. The heat of the day was a sign we had to head to the beach now. Quickly, we decided to go to the Paradise beach and saw the sun set. I spent hours collecting shells here - all of them so different and so beautiful. By the time we left the beach, a part of me had already become a part of the city, which is why I was missing spending my evening at the promenade; almost like I had always been here all of my life and I was missing my daily ritual. I don't know if everyone feels that way, but that's what Pondy felt like to me - like home. This day, we ended, with a long, laid-back dinner at the Spice Route. Ah, it was time to say goodbye already. We spent the Sunday morning having a lazy breakfast with our wonderful hosts. When it was time for a goodbye, I did it quick. Hate goodbyes! But we still had some time before we set for Chennai. So, we headed to the Aurobindo Ashram, which is home to the samadhi of Sri Aurobindo. After spending a few minutes in silence in the ashram, we headed to Auroshikha, which is my most highly-recommended shopping place in Pondy. The small little fragrance shop sells everything ranging from potpourris to room fresheners, as well as body fragrances, and all for very reasonable prices. This is the place to stop by to get everyone those souvenirs. 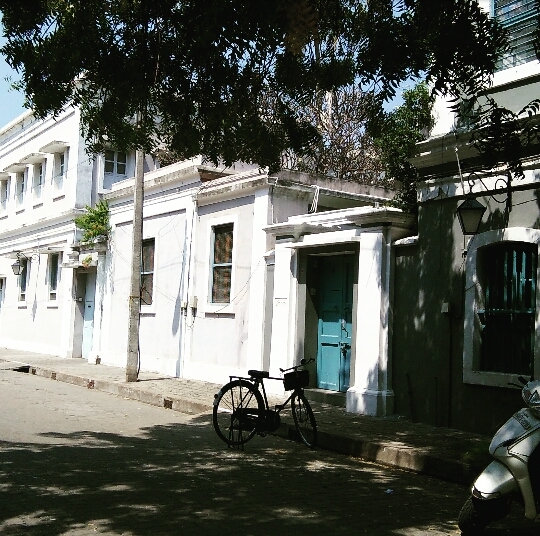 In short, my small visit to Pondicherry was everything I had wanted it to be. A little spiritual, a little quiet and chilled-out, a little romantic, and very much colorful, giving me just the break I had needed.